I told my son, a physics student, that I was reading a book titled The Other Einstein, and did he have a guess who ‘the other’ might be. He made a couple of good guesses but hadn’t gotten it. I said, it turns out Einstein was married … and before I could say any more he said, “Oh, the smart one who wrote some of his papers with him?” Clearly my son already knew something about this woman that was completely new to me. In brief: When Albert Einstein was a student at an elite school in Zürich, there was only one woman who had been admitted to study physics there as well. She was Mileva “Mitza” Marić from Serbia. She walked with a limp and was very self-conscious of her appearance and the fact that she was a woman in an extremely male dominated field. But she held her own, showed great brilliance, and caught Albert Einstein’s eye. The book is a work of fiction. Historical fiction of this sort is very popular and the line between historical fiction and narrative history (like the sort Bill O’Reilly has had tremendous success with) grows blurrier and blurrier. It is especially difficult to spot the difference when the story draws you in and is portrayed so beautifully that it appears quite real. Such is the case with Marie Benedict’s writing. It is easy to forget that this is a work of fiction, based on some historical evidence. Benedict’s writing is crisp and she really gets in to the emotional concerns of Mileva. From her bond to the few other women admitted to the university, to her feeling slighted by the professor, to the birth and death of children, to … well … everything. Benedict draws us in by connecting us to the Mileva as she (Benedict) must have felt connected. We completely understand her fears and passions. But fair warning … Albert Einstein does not come across particularly well. In order to get across the message that brilliant women were held back or not allowed to prosper, Albert is portrayed as doing absolutely everything possible to be the domineering, mysoginistic man – to be held accountable for all men’s sins. And in case we don’t get it from Albert’s action through the course of the book, we have a scene when Mileva (at just about her worst with Albert) managing to get a connection with Marie Curry where Curry paints it pretty clear that Albert is the stone-age man. Which is not to say that Albert Einstein wasn’t this way. I would certainly like to read a biography of him that isn’t biased toward his brilliance, but really explores the relationship with the remarkable Mileva. This book may get confused for a Mileva biography because of the research that Benedict has done to be accurate with places and timing, and she offers up a perfectly reasonable explanation as to why we don’t know more about Mileva. This is a powerful book and one well worth reading. It may change your impressions of Albert Einstein and/or the struggle of women to step in and be accepted in the scientific community and/or higher education. And these likely changes of impressions is not only okay … it is essential to progress. Looking for a good book? 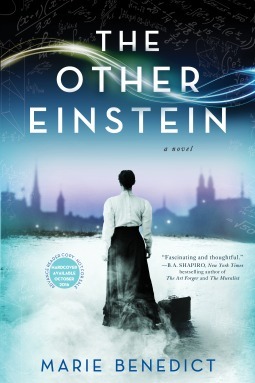 The Other Einstein, by Marie Benedict, is a powerful work of historical fiction that will draw you in and make you forget that you are reading a fictional work.